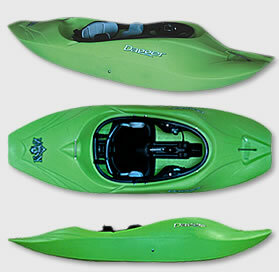 The competition level freestyle boat for the large paddler. Team D wondered what would happen if you took a spud boat and made it faster, slicier, and more controllable. To find out, we ran the Kingpin through our R&D wringer more than any boat we’ve ever produced. What you see here is the result. No-compromise performance in, on, or above whatever hole or wave you decide to dominate. With its’ knifey ends, the Kingpin cartwheels and blunts like longer boats, but in places they can’t even fit. Its hull and rocker profile were developed for cutting edge performance so there’s no need to worry about sacrificing looseness or hop, but it’s been tweaked for speed. So instead of just Macho Moving that wave, you can catch it, and then destroy it. But wait, there’s more. With the addition of our AirCore™ hip pads, a Precision adjustable seat, thigh braces and Camlok™ backband, you’ll be more comfortable than you’ve ever been. You’re welcome. Firstly I both paddle rivers and enjoy playinboating. On the rivers I usually paddle grade 3/4 and have pushed my boundaries to grade 5. I am not the most freestyle minded paddler but do enjoy surfing and playing in holes and I would say my best move would be a helix. Never mind me though! As for the boat, I usually paddle my Kingpin 6.3 which I have owned from new for about 10 months and all I can say is I didn't need to keep the receipt as this baby wasn't going back! Whatever you throw at this boat it copes, without a problem. This boat is a world class playboat, which to me is definetly true, yet can also cope with your grade 4 river. This boat is intended to be thumped about in holes, and riping up waves, which is its job. On the waves this boat carves, really well, and spins on a 't'. In the holes mind this boat excels, cartwheels are not a problem, nor are forwad flips. However when in holes, and cartwheeling this boat is not 100% stable, and on the waves the hull is not quit as quick as some playboats, mainly due too its 'stumpiness'. The comfort of this boat is like an armchair. Many paddlers I know who paddle short boats suffer from cramps and aches, but I at 6'2" with size 11 feet don't suffer from such effects. Also in this boat I find a great feature which Dagger use is the 'D-Bone' structure, which alows the paddler to easily remove the centre pillar creating more foot space. The seat is great and very comfy. However with the backband i find it slips a little, but not a lot to make a great difference. I have also removed the air-core hip pads as they slowly leaked air, know though I have applied a pair of normal hip pads. In the back of this boat I can store a pair of three way splits 9with a squeeze) throw line and a bottle of water and small drybag, which i think is great even though this boat is not designed to take a medium sized load. Overall though this boat is great, it surfs, palys in holes, runs waves, and is comfy too. If you're looking for a playboat or even an allround river play boat you should definetly consider a Kingpin. What more could anyone want? I'm just finding a place for a small fridge, who knows you might see me living in it one day!